I have to admit – this is not my usual style… but with Edinburgh’s Laid-Back-Bikes providing a prominent city-centre home for Paper Bicycle, I eventually cracked and agreed a swap deal with David Gardiner, leaving him stuck with my commuter while I spent a couple of days travelling in style! 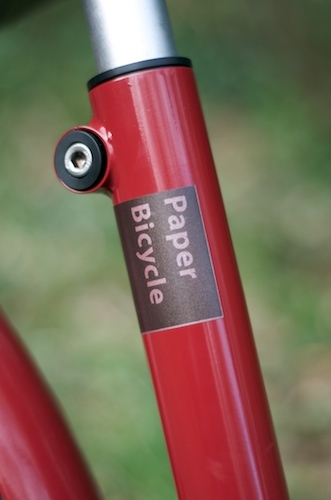 Paper Bicycle is a small-scale operation run by Nick Lobnitz, of Carry Freedom fame, out of SW Scotland. 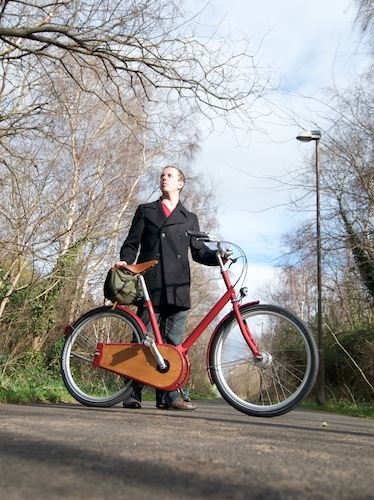 The premise is simple enough – a bike which handles well, is extremely practical, and stylish to boot (some might rather say ‘distinctive’, but it met universal acclaim when I took into the wild). 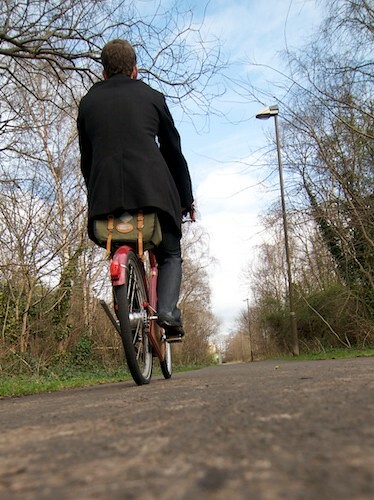 The ultra-distinctive frame features no seat stays or top tube, so it’s easy to step through and over and around. The position is full ‘sit up and beg’ while the fantastic wooden chaincase is also available in poly or aluminium which can then be powdercoated or printed in a variety of ways – see ,  (!!). 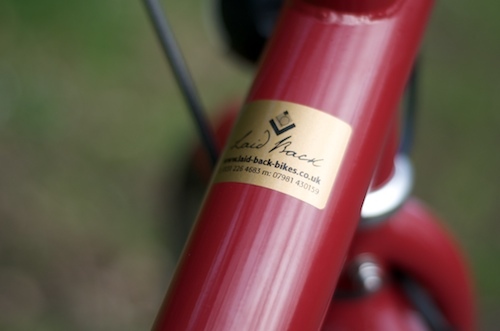 In terms of options, you can get up from the £670 entry point (single speed, no lighting) to over £1100 pretty quickly (8 speed, dynamo lighting, Brooks leather trim with wooden panelling, and a basket or rack) so it’s not for those on a strict budget. 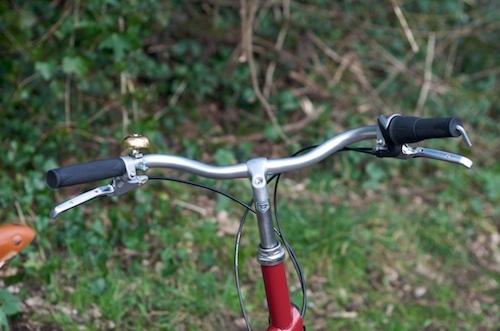 Obvious competitors from the likes of Pashley can be had for £650 with dynamo lighting, hub gears and Brooks included. But then… they’re produced in a factory – and while stylish, theirs is a very old and quintessentially English style. The chainstays on each side form a broad hoop, and on the driveside are fitted with a unique and rather impressive pair of matching panels to form a de-facto chaincase. You don’t really get coachwork on upright bicycles, and the fact that this accomplishes a useful purpose makes it all the more enjoyable. 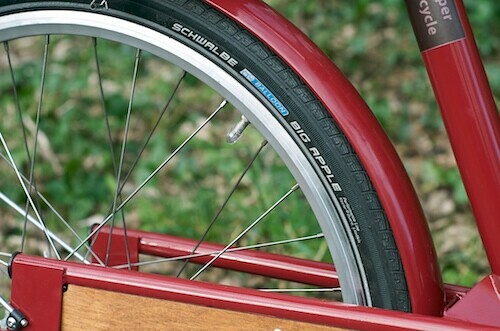 The mudguards are milled from a single billet of steel as you’d expect. …ahem. 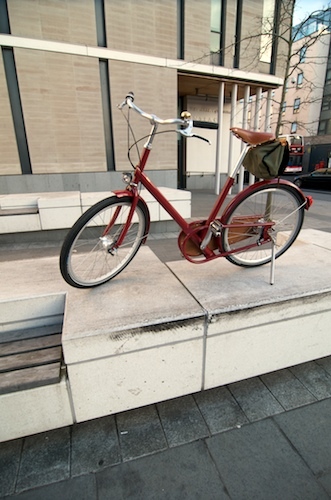 Just checking I hadn’t lost you… they are made of bonafide stainless steel, but probably not milled from giant blocks! All wiring is run internally through the frame which contributes to the clean look. 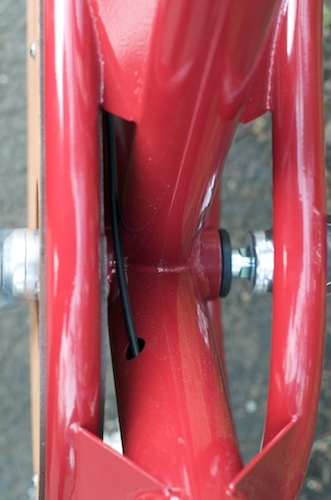 In this detail shot of the bottom bracket area, you can see where the rear gear cable emerges (don’t worry – if water gets in, it drains out of the bottom). 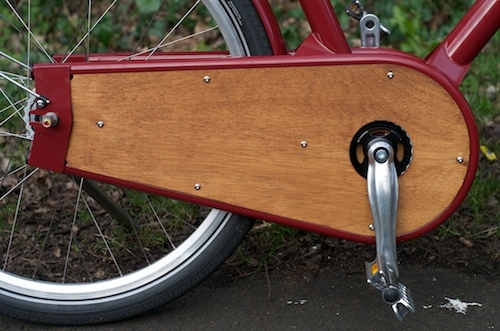 At the front, a lovely disc of wood matching the chaincase fronts the tube. You can also see the provided light here – the “Lyt” by German masters Busch & Muller. I tested the bike at night and, while clearly inferior to the awesome IQ Cyo, there is still plenty of output to ride in unlit areas at sedate speeds, while the nervous can ensure retina-searing action for motorists by tipping the light back slightly. (With quality European lighting like this, the beam pattern is like your car headlights on dip – the brightest section of headlight is at the top, where it needs to shine furthest down the road; in our case, it could just be aimed up at windscreen height). Here however I had a bit of a problem with the demo bike spec, as the light fitted does not come with a standlight, so as soon as you stop, it will go out. I don’t think this is really much of a safety problem, but there are scenarios where it could be useful and, of course, waiting around at traffic lights with no light is a good way to get pulled up by the polis! Given that the RRP difference between Lyt and Lyt Plus (with standlight) is only about a fiver, it seems a little mean to spec the lower version on a bike with an RRP of £1k or more. 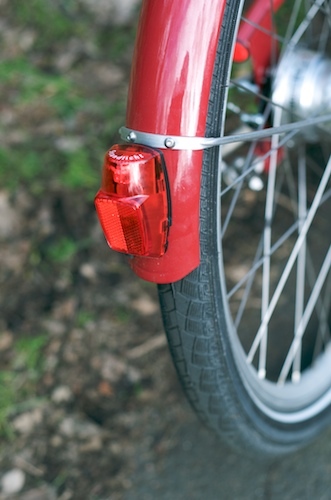 The rear mudguard has a mounted light of excellent brightness which is powered by dynamo hub – it’s just always on, you never notice it, and it’s very difficult to steal. The wiring is all run internally, to maintain the bike’s clean lines. In terms of effectiveness, I’d put this somewhere around the Superflash or Cherrybomb level of safety, as it has ample brightness (by no means annoyingly bright) but wins in the “it will never let you down when you think it’s on” stakes. Dynamo lights, being StVZO-compliant, are also technically legal in a way that the others mentioned aren’t, if you’re the type who worries about contributory negligence issues. 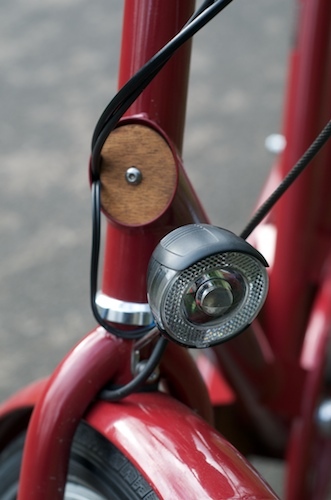 The standlight function keeps the light on for a minute or two while you wait at lights, which caters for that section of the motoring community who are inclined to ignore red lights but will pay attention to cyclists stopped at them. 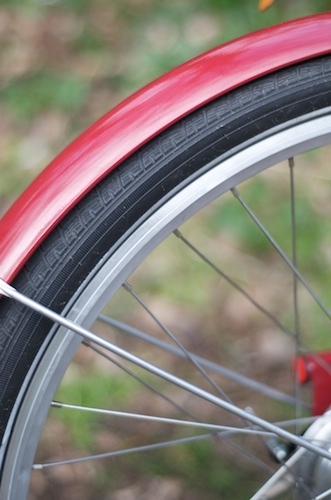 The bike is shod with Big Apple Liteskins, one of the finest tyres money can buy in the “balloon” section of the market and solid performers – comfortable like an airbed, but surprisingly speedy. 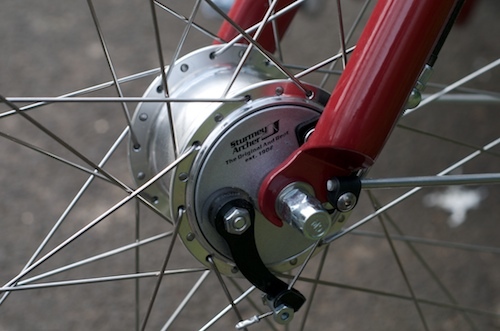 The front hub, also Sturmey Archer, is the excellent X-FDD (drum brake and dynamo). Since I’ve written about this extensively elsewhere, I’ll say no more other than – the brakes are great, the light comes for free, nice. 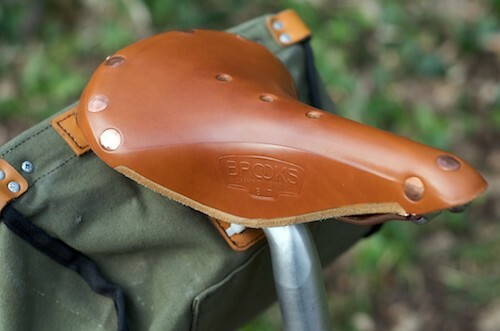 Brooks / saddlebag geeks will note that the stem is of the setback style, which makes it difficult to use a saddlebag without everything pouring out (it’s unlikely that many users of the Paper Bicycle will fit a saddlebag though, and it is still useable, as demonstrated). I trusted it with my SLR at the end of the day! The bars are broad and the sweep makes for great comfort and control (although I found it difficult to filter between lanes of traffic with my hands so far apart!). 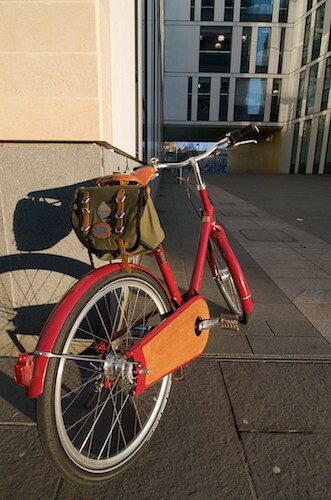 Unfortunately, I also found one of the cute selling points of the bike (it uses big chunky allen bolts and comes with a chunky allen key stuck into the bar-end) to be one of the most irritating, as the allen key end inside the handlebar rattled up and down across the moonscape that passes for a road in Edinburgh. 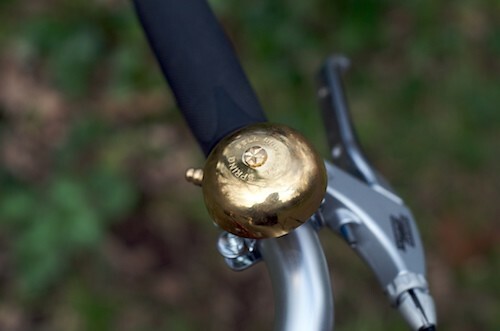 The bell, which is a bit of a looker, also has a lovely long ring that made me want to ring it manically all the time, especially when I passed any cyclist who looked like they were on their way home from a shift emptying dustbins (ideally with drop bars, although that combination is a rare and tasty one). 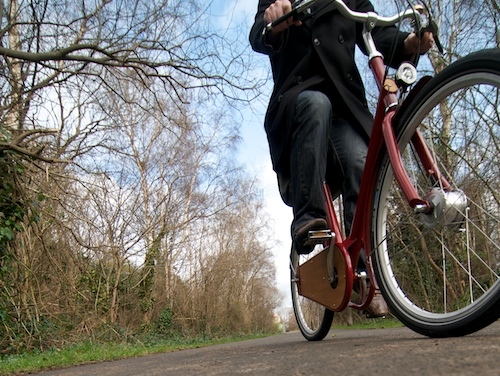 Make no mistake though – this isn’t a racing bike and it doesn’t go as fast as one. The aerodynamics of the sit-up-and-beg posture put you at a severe disadvantage over ~15mph or into headwinds, meaning that I collected most scalps on the climbs when this wasn’t a factor (the weight of the bike isn’t important – since I have a small paunch as commuters go, it probably evens out). 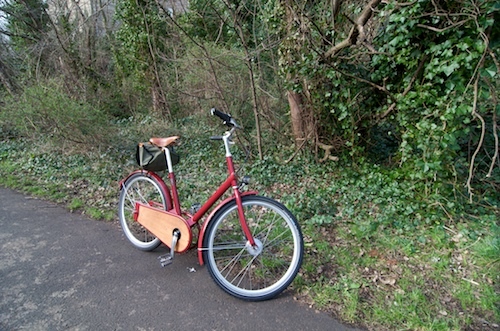 This bike was fitted with the top of the line 8 speed hub – and apart from some serious noise in certain gears (which may well ease after the initial run-in period), it performed nicely. Shifts were smooth and precise and the hub coped with shifting fistfuls at a time. I didn’t try shifting under load (as I have an internally geared bike myself, avoiding this has become second nature). At this point I will break from the unqualified praise to observe that the 8 speed is a strange choice for a bike with 700C wheels 26″ wheels (I’ve left this typo in place to demonstrate how smooth the ride is! 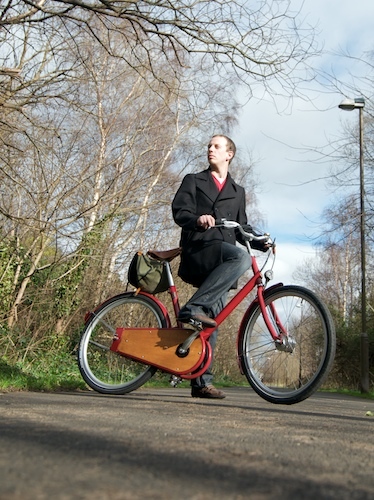 ), being designed for Bromptons and recumbents. First gear is ‘direct’ and things get less direct from there, meaning a supersize sprocket and tiny chainring are needed (if you scroll up to the side-on shot of the chaincase you can actually see the tiny chainring around the gap). 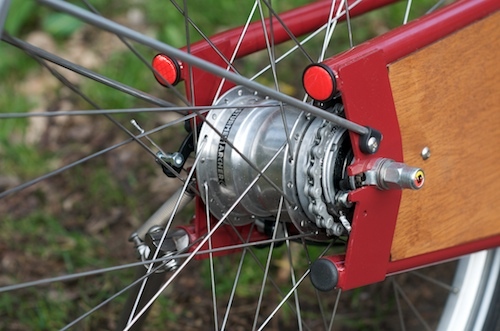 This isn’t something that the target market are likely to notice or care about perhaps, but even sticking to the Sturmey Archer stable there are 5 and 3 speed hubs which would be very suitable (not to mention mid-priced) while the option to fit a coaster brake would remove one cable and lever – how about it? I also found the low bottom bracket slightly challenging. To be fair, I only scuffed it once on the inside of a turn but there really is very little margin for error. (You can see on the shot above that the pedal is well above dead centre but still looks like it’s scraping along – well, it’s not that bad but certainly could catch you out). Apparently the low BB makes the handling as good as it is, and it certainly makes for an effortless step-through, so I guess this is a case of designer’s choice. And, well… that’s about it! It handles beautifully, it’s comfortable and quick (within the confines of quick as defined by aerodynamics and the upright position). With just a couple of caveats, highly recommended. Thats a fab review, thanks. Your right on the front light, I was penny pinching, I saw the error of my ways an age ago but only finished my stock of 60 Lyts last week, with the Lyt plus’s arriving tomorrow. Thats often the catch with manufacturing is it can take an age for changes to apear at the sharp end. 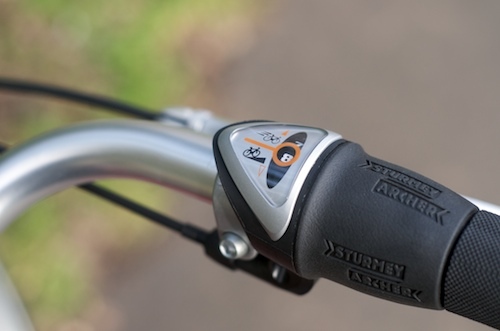 I’m going to start putting rubber rings inside the handlebars to combat the rattle from the allan key, thats something that bugs me a lot as well. The bottom bracket height is 265mm, which is the same as most race bikes. It is low but I’ve found that you very quickly learn how far you can lean and pedal through a corner.